Grandpa Got Scammed for $2,500 … Almost! My father-in-law recently received a call from a desperate sounding woman. She called him by his family name for grandfather and said she was in a Mexican jail after a car accident and needed $2,500 to cover damages and be released. The story is plausible since Mexico only accepts their own auto insurance. Travelers who don’t get it and have the bad luck of accidents are known to stay in jail until they come up with the funds. He thought it was a granddaughter-in-law and was ready to help. Fortunately, one thing tripped up the scammer. He asked how to spell her name (to give to Western Union) and she couldn’t tell him the name. She tried to bluff it by replying that he knew how to spell her name. Fortunately he insisted and the con artist hung up. My husband and I were shocked that this normally skeptical man was so easily convinced to send the money. 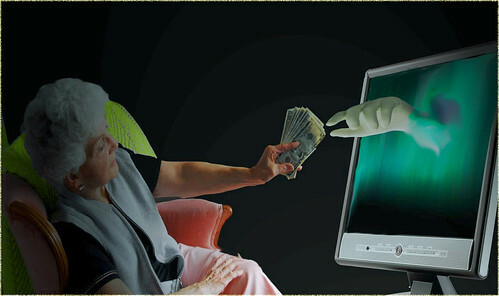 The elderly are targeted for con artists for several reasons. Seniors are most likely to have funds readily accessible. They generally own their own home and have their retirement nest egg. Add in the fact that older folks tend to be more trusting and polite than younger folks. They won’t hang up the phone as quickly or shut the door on solicitors. When the elderly are victimized they often don’t report it because it’s not clear who to report it to or they don’t want their family members to find out. Unfortunately, the grandchild in trouble phone scam was not unique to our family. 11 other local seniors have fallen for the same con and lost many thousands of dollars within the past six months. It’s important for family members to discuss this type of scam with seniors. Ask them to always confirm the information given before sending any money. If my father-in-law had even tried to call the supposed victim, he would have known she was fine and not in another country. He did the right thing in asking the caller to confirm their identity. It frightens me to think how it would have gone if he hadn’t done so. Check how your parents or grandparents set up Facebook and other public profiles. They easily were able to find him in the phone book with the online information. This is also where we suspect the scammer found out the family nickname for grandpa. This experience has taught all of us something. We need to talk about how to protect family members from potential fraud before it happens. It’s also a good reminder about protecting sensitive information, especially online. Have you or someone you know ever been contacted by scammers? There’s an elderly phone scam going around in our town right now. They just had it in the paper. How sad that one of the most vulnerable demographics would be so abused. It breaks my heart. I’m glad they wrote about it in your paper. Getting it out there will help in reducing the number of victims. Some people may think I am elderly because of my age (turning 65 next month). I would always ask for identification. Some small detail the real person would know. I hate to think that baby boomers will ever be called elderly! I guess what age a person considers elderly depends on their own age. My mom belongs to her neighborhood watch, and it’s a really good way to find out about local scams that are going on. She receives email notifications about current threats, like some guy was going around knocking on doors asking for gas money just recently, and the police sent out notice to members. It’s definitely a good way to keep informed. Max, this is great information. I didn’t even know neighborhood watch still existed! My grandfather was hit by one of these. The person claimed to be my brother and needed money for a car accident in Canada. Begged him not to call my father. My grandfather asked a question that no one outside the family should have been able to answer (heck, I wouldn’t have been able to answer it) and the person knew. Maybe my brother or some other person had posted it on FB, I don’t really know. So, Papa sent the guy a couple thousand. They apparently decided Papa was an easy mark and called a second time, this time pretending to be my father. That, at least, was a mistake. This time, Papa mentioned it to my aunt, and she reported the whole fraud. Because they had a Western Union receipt, they at least had something. But the scammers are good. They do their research. The best way I can think of to deal with this is to insist on needing time and that you will call them back. Then actually call the person they are pretending to be, and maybe a couple other relatives, as well, if you can’t get a hold of them. That’s awful! I think people don’t realize how much information they post on facebook. I checked out my father-in-law’s profile and saw right away that he makes too much public (his age, where he lives, etc.). Glad to hear he didn’t go through it. That would have been devastating. People are sick to prey on people’s emotions and goodwill. It’s hard to understand people that would take advantage of someone that way. There are a lot of good people out there, but they are not alone. It is so sad people do this. I am glad he didn’t fall for it. It would be so hard to be elderly (I don’t class 65 or baby boomers as elderly and I am 26, just saying) with so much changed in technology and it would be hard if you have a large family to keep up with it all. That’s despicable. I’m so glad he didn’t fall for it and I’m so sorry for the people who did. Kylie, thanks for agreeing boomers aren’t old:) It is sad that people target the elderly. @ Julie, We are very happy something made him ask for proof that it was who he thought he was speaking with. I’m glad that information wasn’t gleened from the internet! My grandmother is pretty smart when it comes to scams, but I still worry someone will take advantage of her. Previous post: Secret recipe to success: Failure!